The 1.53 hectare site in Mansfield, Nottinghamshire was originally occupied by an engineering works. The site comprised of the works and office buildings, car parking and a number of oil and chemical storage tanks. Associated with the former storage and process areas were soils contaminated with Total Petroleum Hydrocarbon (TPH). Following remediation, the site was developed into a residential housing estate (Plate 1). The development comprised of a mixture of traditional two storey houses and flats with associated residential gardens, managed landscaping, car parking and access roads. The remediation strategy for the Mansfield site was designed to address the on-site source contamination and indirectly, the pathway contamination issues with the intention of protecting both human health and groundwater receptors. With particular regard to the underlying Lower Mottled Sandstone and Lower Magnesian Limestone beds which are both classified as major aquifers of high vulnerability. Envirotreat employed an ex-situ soil mixing remediation strategy for the treatment of over 2,475m³ of contaminated soils. The works were conducted over a 6 week period under the auspices of Envirotreat’s Mobile Process Licence (MPL). 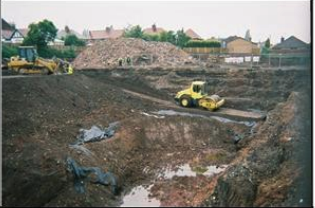 The contaminated soils were excavated, stockpiled and treated on-site using the Envirotreat E-clay® technology. The Envirotreat treatment plant comprised of a slurry production unit and mixing zone. The slurry production set-up comprised of a 1000L paddle mixer in which the E-clay® reagents were combined before being pumped to the mixing zone; a conventional excavator bucket mounted on a 24T excavator was used to mix the contaminated soil and treatment slurry. The soils were mixed in 10m³ batches to allow known quantities of contaminated soils to be combined with known quantities of the E-clay® slurry. The treated soils were then temporarily stockpiled (Plate 4) before being reused on-site as a substitute for imported clean fill.